Great! Now we have the IDs. I recently read a blog post by Tom McFarlin titled, Remove TinyMCE Buttons. 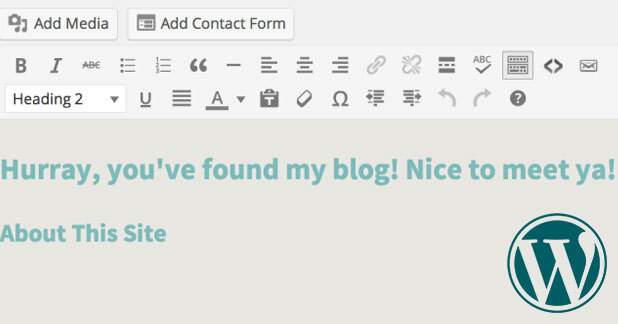 For the confused, TinyMCE buttons refers to the buttons available in WordPress’ text-editor toolbar for formatting and styling your content. Here’s more on how to use the text-editor along with learning to love the text-editor. Anyway, it never occurred to me that I could remove TinyMCE buttons. Tom McFarlin’s blog post inspired me to try it out. Since his blog post was more of a guide through the thought process of completing the task rather than a literal walk-through, once I resolved the mystery, I wanted to share it with others. So here is how I went about it – how to remove TinyMCE buttons step by step with images, code, and further explanation. So the first stop I made after going through the article was the codex reference for the two WordPress hooks Tom mentions, mce_buttons and mce_buttons_2. These are what we’re going to hook into with add_filter to remove TinyMCE buttons. The first hook, mce_buttons, contains the IDs for the first row of buttons in the text-editor toolbar. The second hook, mce_buttons_2, contains the IDs for the second row of buttons. Makes sense, but for someone who’s not familiar with PHP, how would that person go about it? Even for someone who is familiar, it takes a moment to think about how to resolve this. And so, this is what I did. * @param array $buttons Second-row list of buttons. I went into a post or page, since that’s where our functions and hooks are happening – where the text-editor is. This way I can see the output from my de-bugging functions. Then I wrote these two functions into my functions.php. //echoes on the dashboard, for debugging purposes only! The IDs are echoed when you’re in “editing mode” in a post/page on your dashboard. Notice that what’s appearing here is the same as what we saw in the core class-wp-editor.php file. What’s happening is, if you look at the same area in the file we were in earlier, there are comments there using the $buttons variable ( lines 554 and 564 ). For the mce_buttons hook, $buttons is the array for the first row of buttons. For the mce_buttons_2 hook, $buttons is the array for the second row of buttons. I used a foreach loop to go through these items, and displayed them on the dashboard. We can remove buttons that we don’t want now. Borrowing the example function from the Codex, here is how we’d remove one button. Let’s say I want to remove the Bold button, the ID for that is ‘bold’, and I’d use the mce_buttons hook since it’s in the first row of buttons. If I wanted to remove one button in the second row instead, then I’d just replace mce_buttons in the add_filter to mce_buttons_2 as well as swapping ‘bold’ to an appropriate ID. Now if I want to remove multiple buttons, same concept. Know which row the icons are in so you can use the correct hook. This time I want to remove the last three buttons in the second row: Undo, Redo, and Keyboard Shortcuts. The IDs are: undo, redo, wp_help. And I’m hooking into the mce_buttons_2 since the buttons we’re removing are on the second row. And I figured it out! Or so I think. I can’t help feeling like there may be a cleaner way to do this, let’s say I want to remove buttons from both rows, do I really need two separate functions and hooks? I’m assuming since that’s the way core set it up, with each row being an individual hook, that’s our only option. I’m also wondering if there’s a nicer way to debug and show the IDs with PHP, but then again, it’s just for quick debugging and not something that’s going to stay in the functions.php. Anyway, I hope this was helpful, and if anyone else tried this technique out and went about differently than I did, I’d love to hear about it. I’m still pretty novice in PHP and in WordPress hooks, so if you know the secrets of the universe, pleeeease share in the comments. Until next time! You’re welcome – happy it was helpful. Thanks a lot. Helped get me started.